The scents in Banana Dust reflect my olfactory experience of three different places within Spare Room‘s historical building at 222 East Georgia Street. A conversation about Sungpil Yoon’s Environment Samples initiated the work. On December 22, 2017, we conducted a scent tour of 222 East Georgia. The building is filled with hundreds of odours, making it difficult to decipher any one distinct smell to work with. In the end I chose three places in the building as inspiration for making three perfumes, and have housed them in olfactory tubes. Each tube is made with fabric from a different era of upholstering. The remnant odours of the previous uses of the building still remain in the space, in the floors, walls and in the structure of the building. The scents tell stories of what has taken place in these rooms over time. Each perfume is made with rare, all natural perfume ingredients for use on the body. I was surprised to find that the scents I encountered in my tour of 222 in December were largely familiar odours. While objectively unpleasant, these odours are comforting to me in the way that Bachelard, in The Poetics of Space, describes the “house you were born in” – one that you always return to in memory. The odours of old cedar and pine, cold rain on rotting vegetables and cement, faint barbeque grease, stale tobacco lodged in peeling linoleum and the damp mold of leaky cement foundations are scents of my childhood in various old Vancouver houses in states of disrepair and renovation, always under the damp fog cloud of rain. The banana scents of years of turpentine spills and citrus mineral spirits, beeswax, acrylic, cadmium and rusting tin, ochre and linseed are the scents of the studio, the scents of excitement and of thought. Banana Dust reflects scents I found I was unable recreate using natural perfumery materials. Dust is an experience of particles in the air. We say “it smells dusty” but it isn’t a smell, rather an encounter with the air we breathe, brought to our attention by a higher concentration of particulate matter, (mostly plastic and our own skin cells,) than we are used to. Old turpentine mixed with acrylic and oil paints takes on a distinct banana smell. Banana is an odour, but one that can’t be extracted. Synthetic banana flavouring is common, but I am currently interested in working only with natural perfume materials, and the real thing can’t be made. Banana peel can be extracted, but it doesn’t smell anything like a fresh banana. I have seen oranges turn to dust in the south of spain, a most magical, fragrant phenomenon. A banana could never turn to dust in Vancouver. It is too damp. 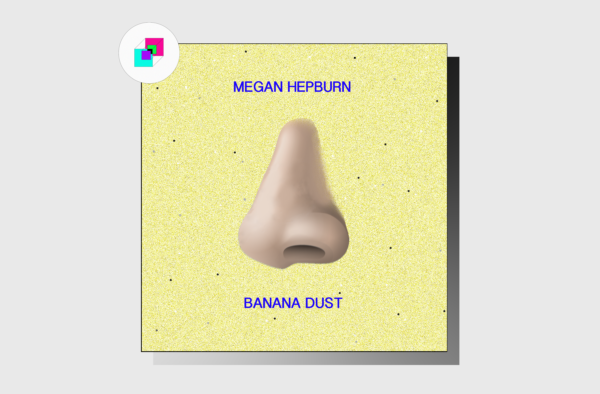 Banana Dust is my impossible ideal; a utopia of natural perfumery. Megan Hepburn earned her MFA from Concordia University in 2010 and BFA from Emily Carr University in 2005. Her work is based in painting with interests in dance and somatic practices. Her work won the Joseph Plaskett Award in Painting in 2010, and was shortlisted for the RBC Painting Competition in 2010 and 2015. She has exhibited work across Canada and in Europe since 2006, and her writing has been published in journals including The Capilano Review, AAB, and The Benefit of Friends Collected. Recent exhibitions include The Price and the Witness at Duplex in Vancouver and Dark Sands Ask Why You Talk So Fast at Deluge Contemporary in Victoria. This is her first exhibition of purely olfactory work. A novice perfumer, she has a longstanding fascination with odour, and has recently launched the new perfume line Cracher Dans La Soupe in Vancouver.